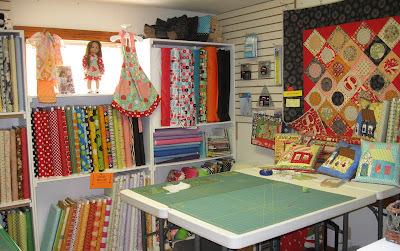 As I continue on my Blank Quilting adventure, this visit was to the second shop in the childrenswear trilogy, Stitcher's Playhouse in Smyrna, Tennessee. (See the earlier post here.) The white crapemyrtle near the shop's entrance was in full bloom on the hot August day that I was there. 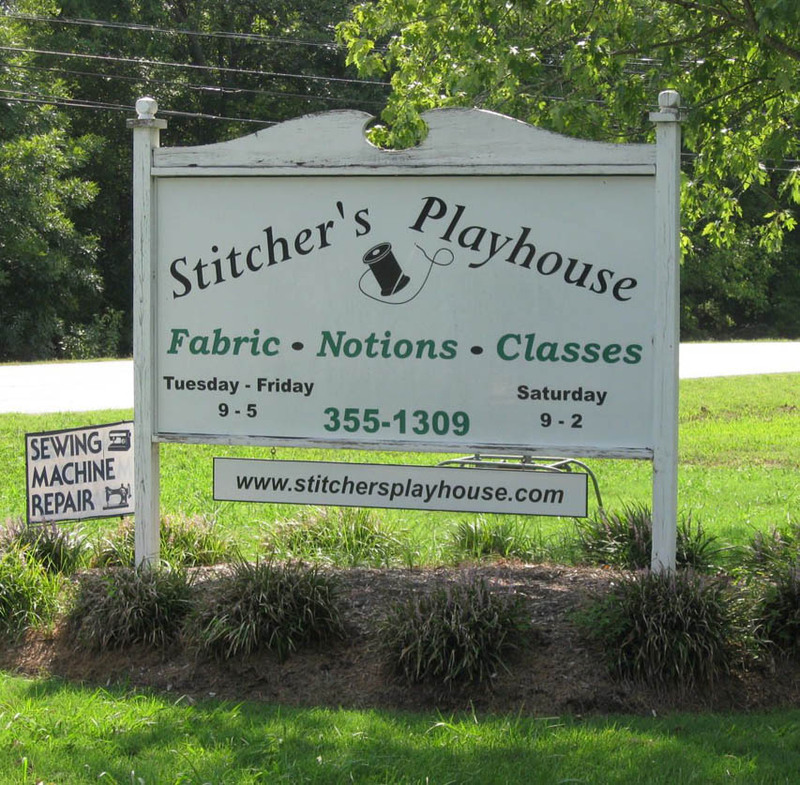 Stitcher's Playhouse in Smyrna, Tennessee. 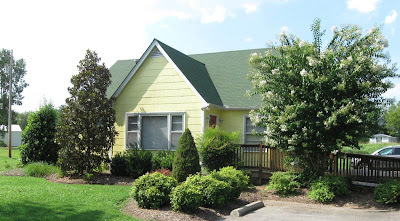 Once inside this cute yellow house, however, the samples and displays of little girl jumpers and smocked bishop dresses were reflecting the upcoming fall and winter seasons. Red and green holiday outfits and accessories crowed the shelves of colorful cotton fabrics. The workmanship of the outfits on display was exquisite. From the hand-smocked yokes and appliqués to the lace, ruffled and rickrack trims, no detail was too small and each technique was lovingly and beautifully executed. 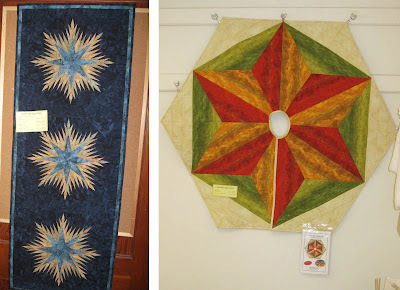 There is lots of talent at this shop! 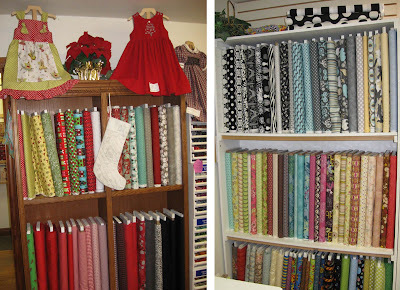 Elegant holiday outfits and festive holiday cotton prints. 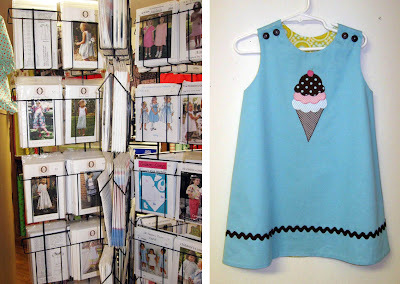 Stitcher's Playhouse has a full selection of patterns for children's garments and accessories. A rack of patterns for children's garments (left) and a lined jumper with an ice cream appliqué. 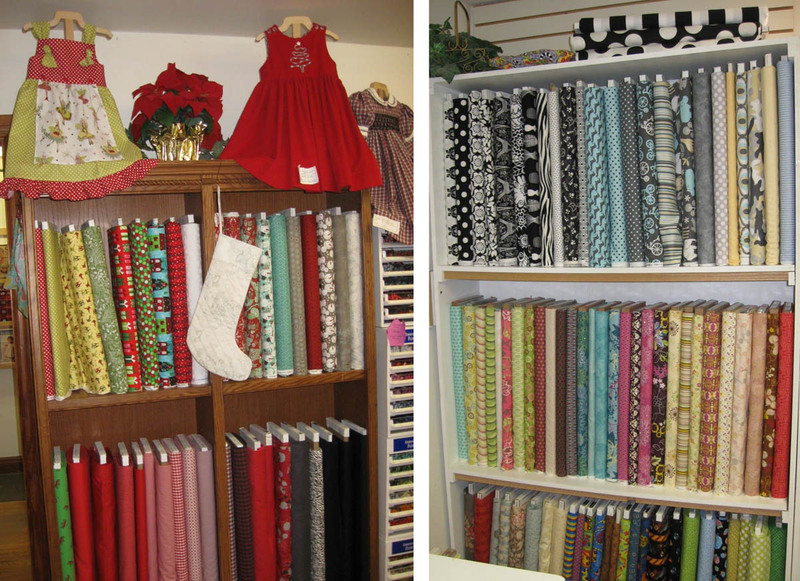 Ann, the shop's owner, showed me one of the shop's most popular jumper patterns—with a reversible and detachable bib. 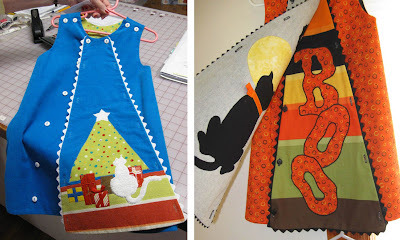 This outfit can transform from one season to the next but putting a different appliqué motif on each side of the reversible bib. The reversible bib on this jumper makes it very versatile. 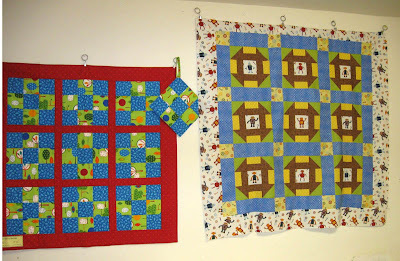 In addition to children's clothing, the selection of brights, polka dots, stripes and graphic print fabrics were well served in projects such as wall hangings, lap quilts, table runners, doll clothes, tree skirts and patchwork pillows. Ann also likes to keep a bolt or two of Eclipse jet black, or "double black" as she refers to it, on hand in her shop as she indicates, "the solid black is perfect for accents and trims" on many projects. Don't you love the asian feel of this handsome quilt? 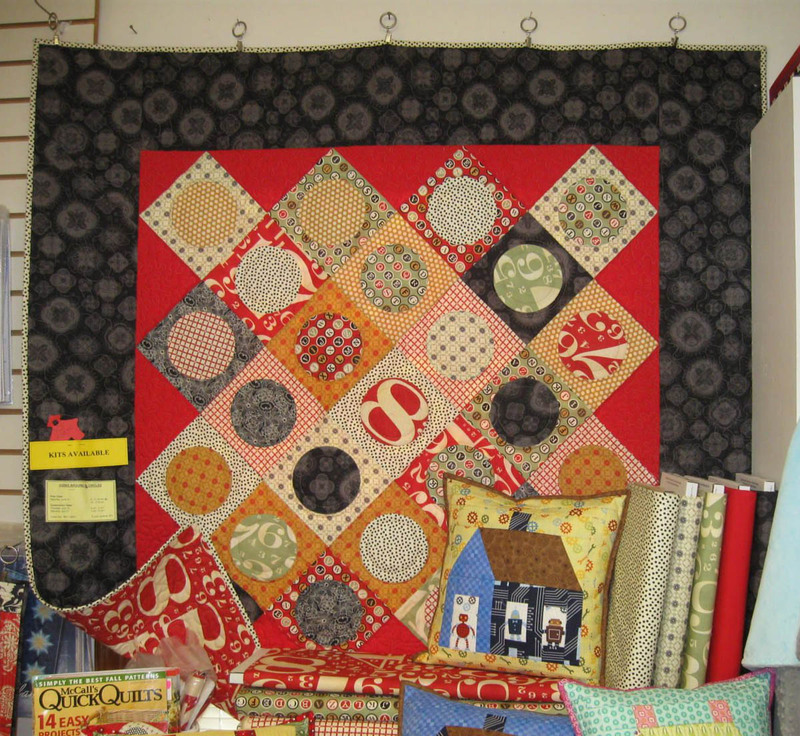 The solid red fabric contrasts with the monochromatic border and sets off the geometric and organic prints of the quilt blocks. 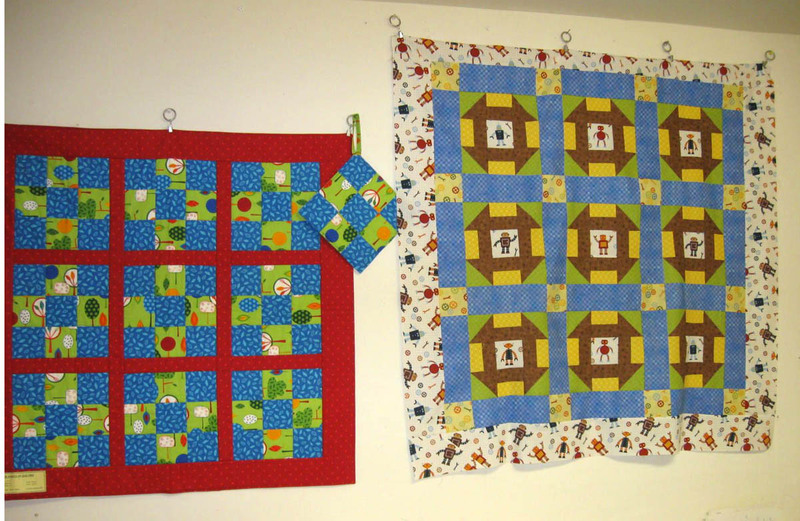 The novelty prints make these happy quilts perfect for toddlers. 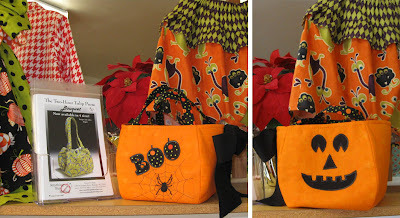 Here is a great application for the"Two hour Tulip Bag" from Janice Pope's Anything But Boring pattern line. A trick-or-treat bag just in time for Halloween. Stitcher's Playhouse provides a diverse offering of classes (quilting, clothing, accessories, smocking and more) for both beginners and experienced sewers and quilters. 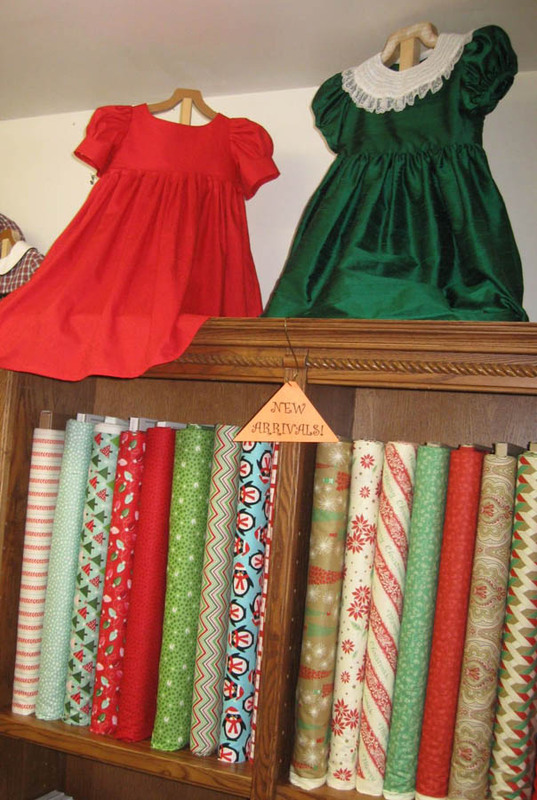 Jeanne, one of the instructors, was conducting a garment class and students were learning how to face a peter pan collar on a little girl's dress. 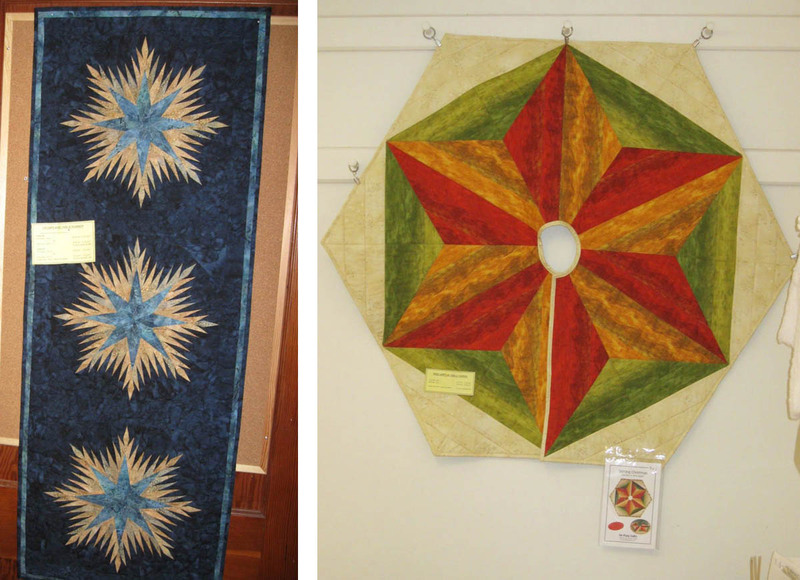 Class samples include (left) paper pieced star table runner and a tree skirt (right). 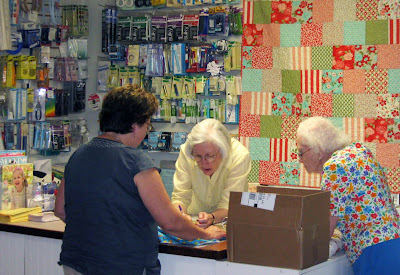 Ann (center) assists a customer with her project. Stitcher's Playhouse is a charming shop where the owner and staff go out of their way to make you feel welcome and provide top-notch service. They share their passion and expertise in sewing and quilting and create and offer a variety of classes that make learning fun.